Wouldn't it be nice if you had a vacuum cleaner with you when you are on the go with your family? Do you find yourself constantly battling messes in your vehicle? 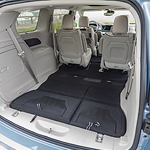 There is an available feature for the Chrysler Pacifica Hybrid that will meet your needs. There is a Stow 'n Vac system that you can have added to this vehicle for times when things get messy.